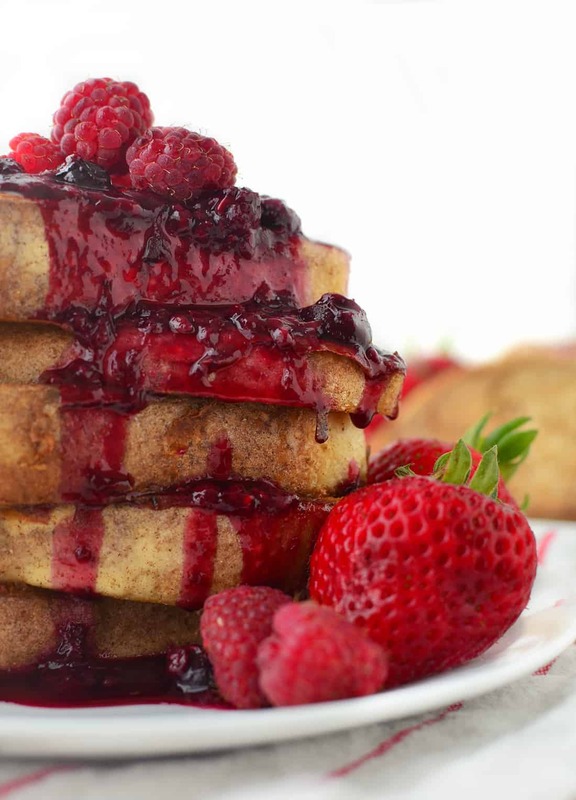 Does anything say “vacation” more than piled high stacks of French toast and triple berry syrup? Okay, maybe lying at the beach with a book in one hand and Mai-Tai in the other, but I digress. I’m currently ocean-side, oversize coffee mug in hand while reminiscing on the decadence of this berry filled syrup. If I could only make my computer come to life, a plate of this toast would complete my picture-perfect morning. I know it’s only Tuesday, but breakfasts like these have me thinking of the weekend: homemade French toast, my favorite book of the moment and a few hours where I don’t feel the pull of having to do anything. Kinda like how I’m feeling right now. There’s something about being on a gorgeous island that makes time slow down. Right now my priorities include a morning nap on the lanai, snorkeling off the coast, and eating as much fresh pineapple as possible. 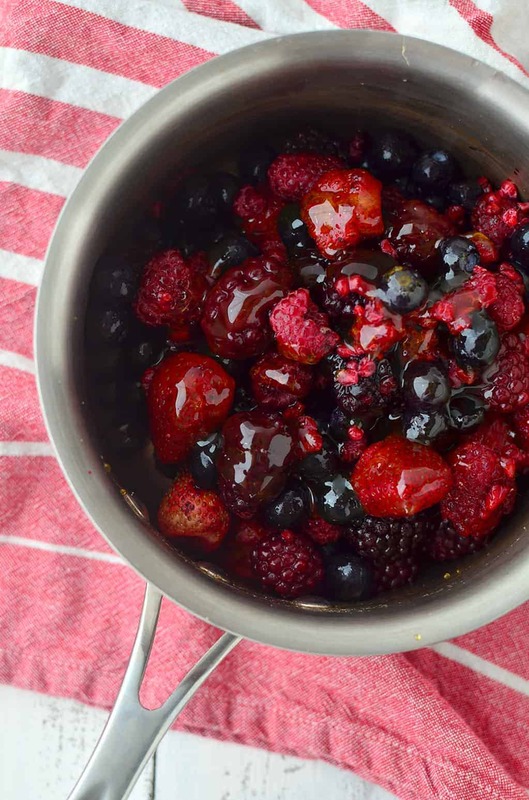 Even though it’s peak berry season, I’m taking advantage of frozen berries to make this syrup. 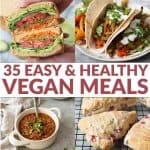 I rely a lot on frozen fruits and vegetables when texture doesn’t matter; it’s a great way to save money, and more often than not, frozen contains more nutrients than fresh. Since frozen foods can’t ripen once they’re processed, they’re picked and frozen at the peak of ripeness. Think of nutrients in a bell curve; as produce ripens so does the availability of vitamins and antioxidants. As it transitions from perfectly ripe to overly ripe, nutrient availability declines. Using frozen berries also allows this syrup to be made for chump change compared to using fresh. 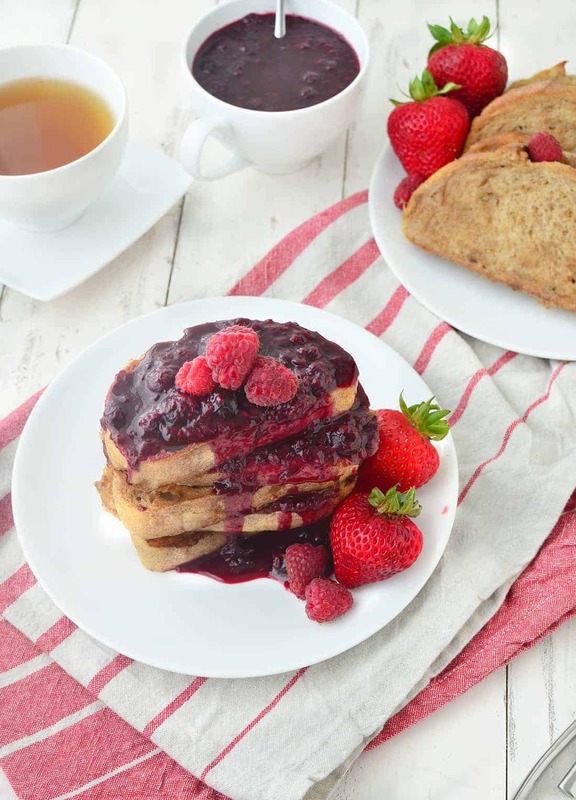 For me, the perfect base for my triple berry syrup was pillowy soft French toast. 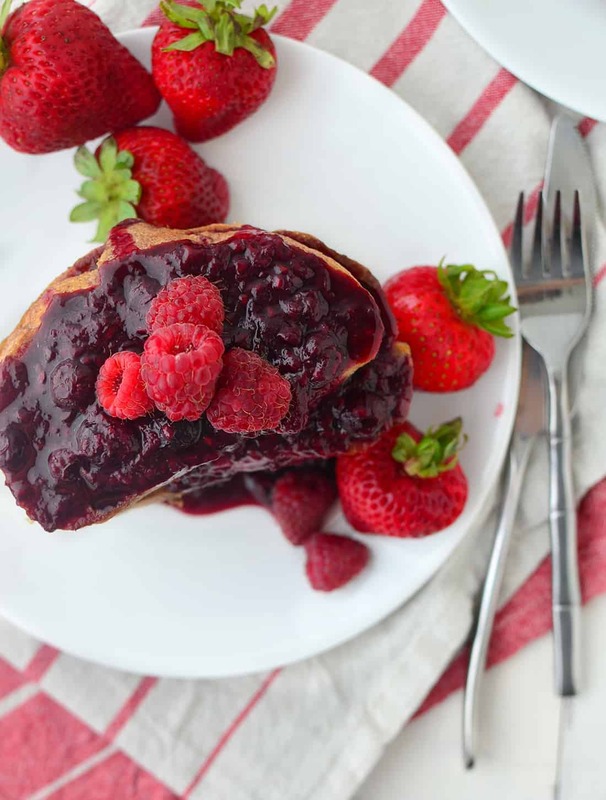 While we don’t always think of French toast as a healthy breakfast option, this recipe from Minimalist Baker is packed with healthy fats- using chia seeds instead of the typical egg wash. 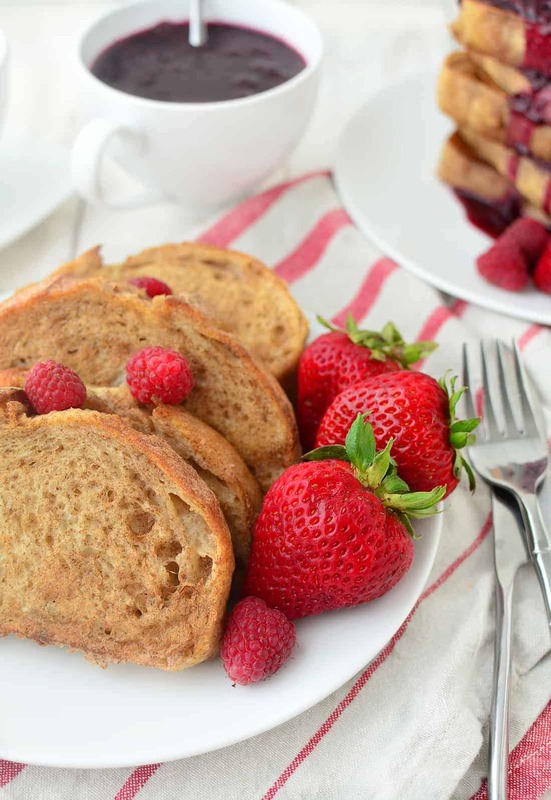 Honestly, this is one of my favorite French toast recipes. I have a hard time eating really rich breakfasts in the morning, and I dislike overly eggy French toast. 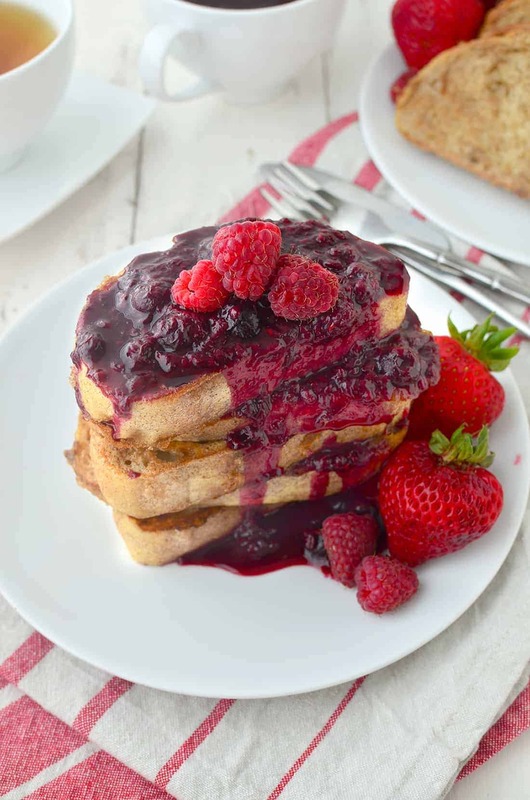 Enter this triple berry French toast. The perfect compromise. 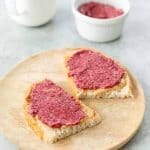 For a truly decedent treat, try this jammy syrup with my peanut butter one for a layered peanut butter-and-jelly effect. One, or both, are incredible on pancakes, ice cream, French toast, waffles, or anywhere you would use berries. If you have any extra sauce, place it in an air-tight jar. It will last up to a week in the fridge! Triple Berry Syrup! 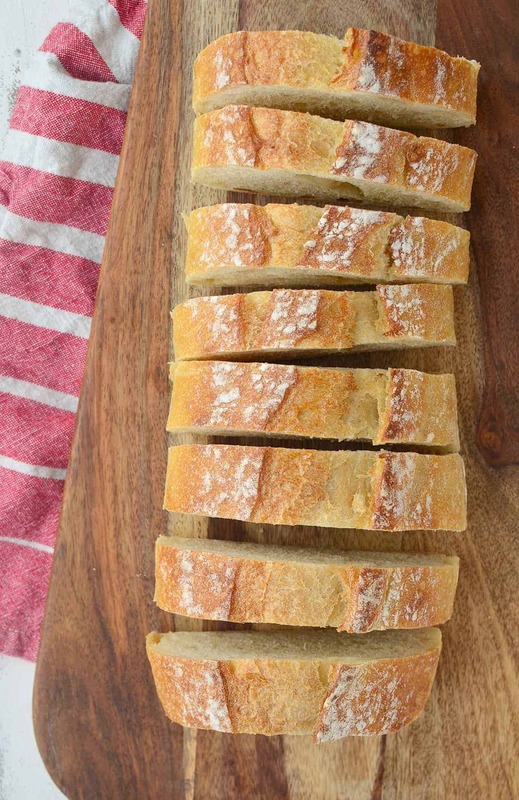 The perfect topping for french toast, pancakes, ice cream and more! Low-sugar and packed with antioxidants. I served this syrup with this French Toast recipe. Place the above ingredients in a small saucepan and bring to a boil. Use a wooden spoon and smash any large berries up a bit. After the mixture has come to a boil, reduce heat to medium-low and let simmer for 10 minutes until it reduces and is thick enough to cover the back of a spoon. You are adorable- and make me want to stay home and cook this up right now! I love using frozen berries too- such a lifesaver and $$ as well. I hope you are enjoying Hawaii! 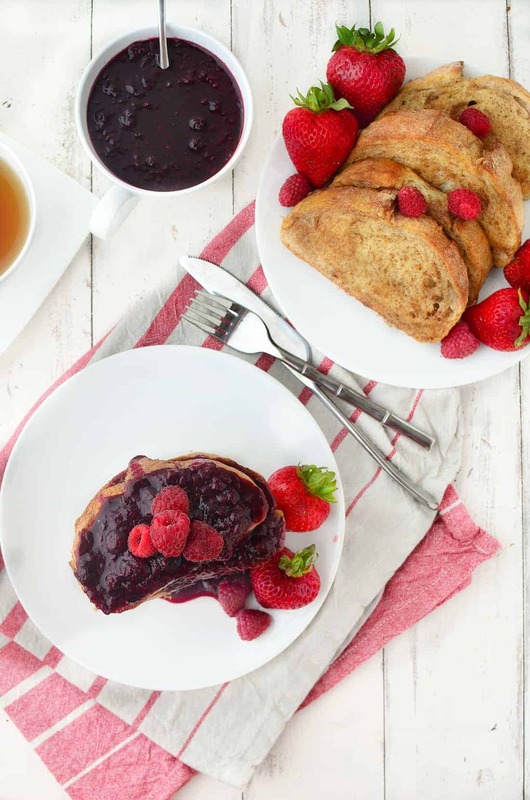 I think every day should be the weekend and we should have this gorgeous french toast and triple berry syrup for breakfast every day. Sound perfect? I think so! This is absolutely amazing, Alex!